Macintosh makes a lot of wonderful pieces of technology, but they do not make a tablet. 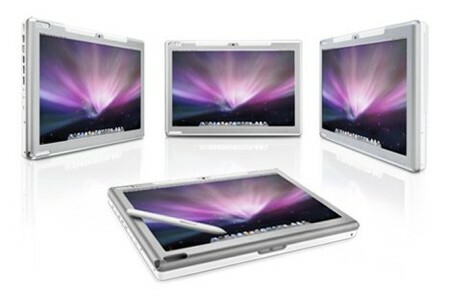 Pictured above is the Modbook, the closest you can currently get to a Mac tablet. Though not officially built by Apple, they are an Apple Premier Developer and that isn’t too shabby. Several people have taken it upon themselves to fashion Mac tablets of their own, varying from extremely professional looking finishes down to duct tape and wire. Lets take a look at some of the more popular ones out there. First lets go to the place that started many of these projects. 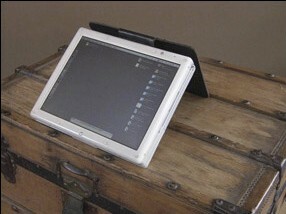 Though not strictly a Mac tablet, the projects at Bongofish.co.uk deal with making your own Cintiq. The instructions are quite in depth and the forums have several Mac projects to view. Back around 2004, [Joseph DeRuvo Jr.] put together this fantastic little mod. He grafted a Troll Touch screen to a Mac laptop and made a custom case for it. He did a fantastic job of enclosing everything and making it look great. One cool feature is that the cover that protects the screen, folds back to form a stand when needed. This guy put a lot of hard work into this and it shows. Another extremely polished model is the iTab. Inspired by the DIY Cintiq at Bongofish, [wiestudios] has put together this beautiful piece. Going more with Wacom than Mac style, it’s another fine bit of engineering. It even has an apple and crossbones etched in the back! Polish isn’t everything though, sometimes simplicity can bring a project into the hands of the average Joe. Check out [Florian Mourer]’s ongoing project. He plans on building a custom enclosure at some point, but for now he’s got a pretty simple modification working. Again, this one uses a Wacom board so it is pressure sensitive. Unlike the others, he is limited to only a portion of the screen being sensitive due to the size of the tablet he had available. Our very own [Caleb Kraft] has also ventured into the area of making Mac tablets. Using a cheap Wacom board, some duct tape, a screw driver, and a torx wrench, he shows us how to build a pressure sensitive Mac tablet in 15 minutes. With the advent of the iPhone, it seems that a Mac tablet should be on the horizon. This is just one of the many cases where hackers have the technology first. @pascal, the reason some people don’t want to buy a Leveno is because it is a PC that runs Windows. And seeing as Cintique tablets are SO expensive some people want the best of both worlds. So, since Apple doesn’t make a tablet and the ModBook is expensive, why not just turn you old computer into a tablet! Some people need (or at least really really want) Mac OS X, so that is why they don’t buy a PC tablet. i don’t like to be nit-picky, but this one is really bothering me. macintosh does not make anything. saying “macintosh makes a lot of wonderful pieces of technology” is like saying “windows makes a lot of good operating systems”. What’s the big deal about tablets? Do users other than serious graphic/art people really get much use out of it? Are there reasons why mac doesn’t have an official tablet.? Personally, I like the Mac OS X for its elegance and polish, but I don’t buy Macs as the hardware is overpriced, IMO. Were I to be desirous of a Mac tablet, I’d buy a regular tablet and put OS X onto it, for an affordable Mac tablet with OEM finish. It would lack that DIY feel though. This awesome post was made on July 14th 2008. It’s now January 27th, 2010, and Mac FINALLY made one. And it’s an oversized iPod touch. To all the makers on here, VERY NICE WORK. You’ve all beat Apple at their own game, and two years ahead too. Well this post was made July 14th 2008. It’s now March 7th and Apple managed to make its second generation of one of the best tablets. Noww make it do something usefull..